A DATA Bus is shown in a file photo. With football season right around the corner, the Delaware Area Transit Agency (DATA) has announced a new service that will provide a different option to Delaware County Buckeye fans heading to campus on game days. Beginning Sep. 1 when Ohio State kicks off the 2018 season against Oregon State, DATA will offer express shuttles from three different Meijer locations — Delaware, Lewis Center and Westerville — to COTA’s Crosswoods Park and Ride location on Huntington Drive in Columbus. From Crosswoods, COTA will transport fans to the corner of Neil Avenue and 17th Street, just one block from Ohio Stadium. COTA runs three hours before kickoff and two hours after the game is over, and pickup is at the same location. “Riders don’t have to worry about parking and all the traffic and construction in the area, they can sit back and let DATA Express drivers handle the road,” said DATA Bus Executive Director Denny Schooley. A round-trip ride with DATA Express will cost $5.50 for adults and $2.00 for children ages 12 and under. All rides will need to be prescheduled with DATA, and the deadline to book your ride will be two weeks before the game the rider is attending. Payments must be made at the time of scheduling and no refunds will be issued. Riders will be given a wristband that must be worn to ensure passage back to Crosswoods following the game. For the COTA portion of the trip, riders will pay cash at the Crosswoods pickup location. COTA fares are also $5.50 and $2.00 and parking at the Crosswoods Park and Ride is free. Students with a valid BuckID can ride the COTA bus for free. DATA Bus pickup times at the Meijer locations will be determined a week before each game, but Ginny Berry, the head of marketing and community relations for DATA, said times will be set to allow for riders to get to campus with time to enjoy pregame festivities. Berry said surveys were conducted throughout July to gauge interest in the service. She added that around 2o0 people responded to the survey, representing all areas of the county, and that of those 200 responses, 75 percent said they attended games and would use the service if it were provided. Scheduling for all home games is now open. To book a ride, call 740-363-3355 between 9 a.m. and 4 p.m. For more information about DATA Bus and its services, visit their website at ww.ridedata.com. 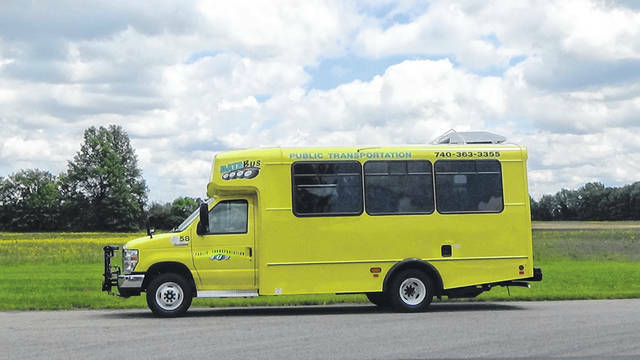 https://www.delgazette.com/wp-content/uploads/sites/40/2018/08/web1_Data-bus.jpgA DATA Bus is shown in a file photo.